For our first actual unit guide, we are going to take a look at our hero of the rebellion, a true Legend, Luke Skywalker! The only question is how I'm going to get my Luke painted in this scheme. Oh boy, where to begin. Luke is going to be your mandatory commander until Leia comes out. He is a powerhouse, though not the most expensive option without upgrades for the Rebels (that prize goes to the Airspeeder). As a unit he excels at medium range (2 or less) combat and will absolutely ruin someone's day in melee. In terms of damage dealt, you are expecting an average of 1.75 hits per attack with his blaster, or 3.75 with his Lightsaber (1.875 with Lightsaber Throw). Pierce 2 means most of that damage is getting through, if it isn't stopped by cover, and it's nearly a guarantee to produce a suppression token even then. Because Luke changes Surges into Criticals, you're more likely to get hits through anyway - 0.5 average damage from his Blaster and .75 from a Lightsaber Throw. Not bad for bulls-eyeing a womprat. 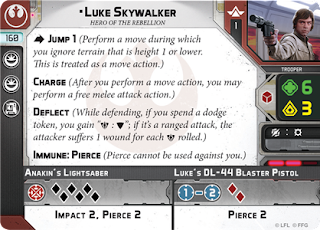 Luke also boasts 6 health and a Red defense die (50% chance of blocking hits) with Deflect bringing it to a 4/6 chance to avoid damage (and a 1/6 chance to send the damage back). He's also immune to Pierce, which only shows up in a few places, notably in mirror match fights against another Luke and also against his pappy. Luke moves what I would call a "standard" speed 2. If you're playing with custom terrain, he also can Jump 1, which lets him ignore terrain and go up or down without clambering. That's cool, and helps him move faster if he needs to go up and over something. It's an action so he can't jump up and jump down on the same turn. He can also Charge. This lets him move into melee range and then smash something with Pappy's Lightsaber. Free action, so you can move twice to get that sweet, sweet melee attack off. For Upgrades, you have a few options for Luke - he can equip 2 different Force Powers, and 1 Gear upgrade. - Battle Meditation lets you issue orders to any unit on the battle field, and frees up your AT-RTs and Airspeeders to take Jammers instead of Long-Range Commlinks. - Force Push is a free action, but an exhaust, that lets you make a Speed 1 move with a trooper. Push Vader away so you can run? Pull someone just out of melee range into your Lightsaber, or out of cover? Some quality options there for controlling the battlefield. - Force Reflexes is also a free action to get a dodge token, and also exhausts. Get your deflection on! Useful if you're planning on using Recover anyway to get rid of some suppression tokens. - Jedi Mind Trick is Light Side only, and is also a free action. Puts suppression directly on enemy troopers, very useful if their commander isn't around, because it is enough to panic a generic Corps if they aren't near something with more than Courage 1. - And finally Saber Throw lets you get a ranged attack with your melee at Range 1-2. It's a better attack than Luke's blaster, and combines with Targeting Scopes to make Aim tokens useful for ranged attacks. - Targeting Scopes, ironically enough, are only useful with your Lightsaber. Aim already lets you reroll 2 dice, and you only have 2 dice with your blaster. - Grappling Hooks aren't that useful when you can just Jump up to the next level, but if you're playing somewhere with height 2 obstacles, maybe useful? Son of Skywalker is Luke's one pip card, and it is all about getting the most oomph out of Luke's activation. While it should be noted that it is not necessary to activate Luke first once he is commanded with this command card, it seems to be set up to be used in this way - to quickly go and double attack a target to remove it from the board. 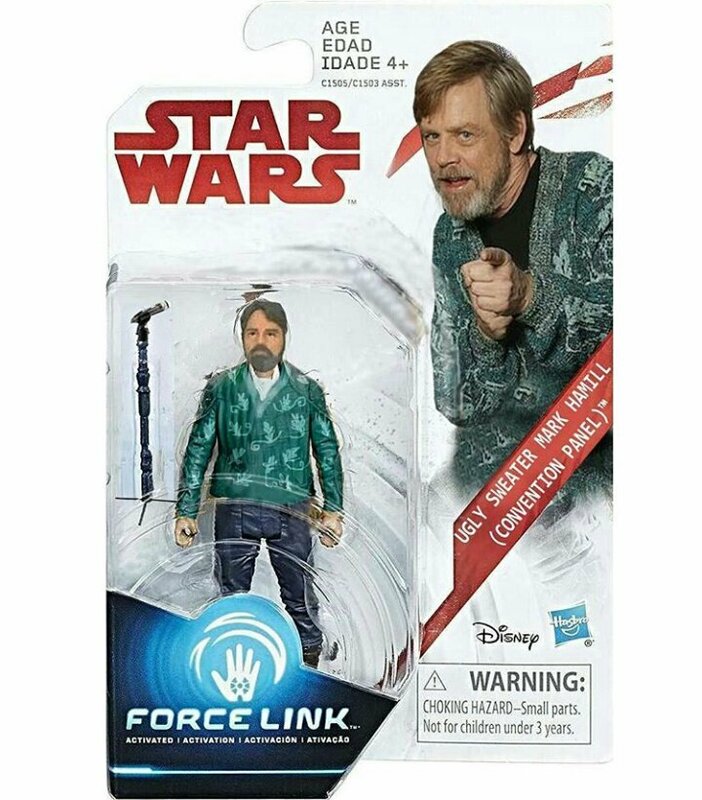 After all, the only unit who can receive a command with this card is Luke himself, so if you have any kind of variation in your army, Luke will be the only one who you will know exactly when he can activate. If Luke is in melee combat this could be invaluable, doubling your number of attacks, but (assuming you have 2 commanders) you are giving up the flexibility of Ambush activating any unit in a good position. 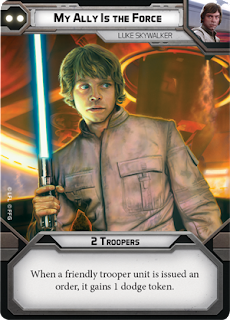 Luke's 2 pip card is also more restrictive than the generic 2 pip card, limiting him to just activating troopers. One thing to note though is that Luke himself is a Trooper, and thus can be activated with this card as well. While you give up the flexibility of providing orders for non-trooper units, this activation gives dodge tokens to your troopers, potentially activating Luke's Deflect or setting up your Rebel Troopers with the first Dodge token for their Nimble ability. 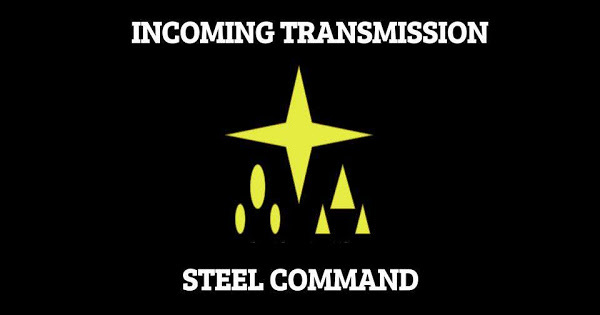 Just know that this command is going to do nothing to help you get your Airspeeders or AT-RTs shooting. This is a true heavy hitter. While you're giving up Priority most likely by playing this card, you get to put a few tricks in play. First, Luke becomes a difficult proposition to attack, as he gains the dodge token with the command and thus can Deflect. 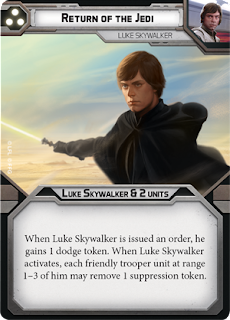 You get 2 other units to activate of any type, which means between Luke's commander token being pulled and two other order tokens issued you can get yourself a pretty good order pool of hopefully just Corps tokens. Luke being able to pull off suppression tokens is another cool trick for this card. 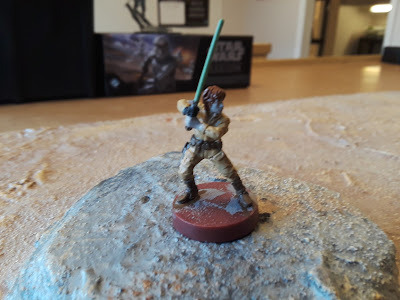 Don't forget that Luke is a friendly trooper at Range 1 of himself (I am saying this based on the "Issuing Orders" section of the rule booklet, that says units being issued orders must be at Range 1-3 of the nominated commander - and that all other FFG games work this way). Luke's Courage Value is pretty good in and of itself, but he's not immune to panic, and if he has to move away from his troopers, he can send them into a panic if they're not allowed to use his Courage Value anymore. I think I will probably say this a lot because it is standard throughout all these models, but PRIME YOUR MODEL. The plastic FFG uses for this is not the same as the ones for Armada squadrons, so you will definitely need to prime before painting. I have painted my Luke up in a mix of Cloud City and Return of the Jedi, because I like Green Lightsabers better, damn it. I'll edit in the colors I used once I have them in my hand again. You can actually use Battle Meditation to bypass the unit restriction on the command card as well as the range, so with that you could use My Ally is the Force or Son of Skywalker and still give an order to a T-47 or AT-RT. Very true, and not something I realized while writing this article!